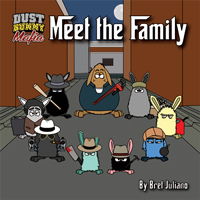 Merry Christmas from the Dust Bunny Mafia. May your Christmas sweaters never be as ugly as these ones…unless it’s for an ugly sweater contest or there’s money on the line then may the odds ever be in your favor! Leo the Boss: [on the phone] "What’s up ma?" Marianna Veronisci: [via phone] "I was just calling to see how the boys like the sweaters I sent them." Frankie the Force: "If this came from anyone else it’d be in the trash already." Salvatore Bolts III: "I don’t know what Frankie’s talkin’ about, mine is fabulous!" Kenny the Crypt: [off-screen] "Say cheese!" Are those the elves from Elf Bowling on Salvatore’s sweater? Because I’m pretty sure I remember that dance taunting me when I was younger. That’s exactly who those elves are! Remember the song they sang too?